Mitsuko Uchida, the 50-year-old pianist the critics nicknamed the high priestess of Mozart," "the leading Schubertian of our time," and "the greatest classical pianist of the present day" will be performing an all-Schubert recital (3 impromptus and 2 sonatas) at the Festival International de Lanaudière on July 23, 1999. 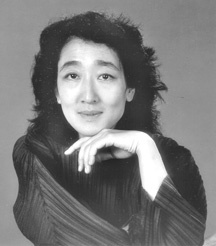 Mitsuko Uchida started her piano studies in Tokyo. Her family was not particularly interested in classical music, but they thought it appropriate for a young girl to study an instrument. In 1961, Mitsuko Uchida's father was appointed ambassador in Austria and the whole family moved to Vienna. Mitsuko Uchida continued her studies with Richard Hauser at the Vienna Academy of Music. When her father went back to Japan four years later, she decided to stay behind in Vienna. In 1969, at age 20, she received the first prize at the Beethoven Competition. The following year, she won second place at the Chopin Competition in Warsaw. In 1973, Mitsuko Uchida took an important step towards the pursuit of her musical career. She decided to stop taking lessons and moved to London (where she resides to this day). In 1975, she won second place at the Leeds' competition. Despite all those prizes, fame was slow to come. In 1982, she performed all of Mozart's nineteen sonatas at London's Wigmore Hall. The public and the critics went wild. An executive from the Philips recording company attending the recital booked her right away to record all nineteen sonatas. She also recorded all the Mozart's concertos. She intends to perform those once again in the years 2000-2010, conducting the orchestra from the keyboard. Despite her success and fame, Mitsuko Uchida barely gives 50 concerts and records only one CD a year (exclusively for Philips). She is very private, refusing most interviews. She despises all the glamour and the marketing strategies of the musical industry. She likes taking risks and doesn't intend to become a commodity to be traded. An intriguing pianist, she prefers to surrender her personality to the expression of the composer's ideas. When she is away from the concert scene, she doesn't listen to other musicians' recordings. Instead, she analyses in much detail the scores she will be performing and finds out about the instrumentation typical of the era. She reads composers' biographies extensively to capture their personality at the specific time they wrote a particular piece. After that, she starts the interpretation process, instinctively at first, then by practising at length, playing, thinking and sometimes dreaming. Mitsuko Uchida's musical interests don't stop with Mozart, far from it. In the last 15 years, she has performed works by Schubert, Beethoven, Schumann, Debussy, Bartok and Schoenberg and charmed audiences and critics alike. Her powerful concentration, her flawless technique and her colourful playing making her stand apart from other pianists of her generation. She achieves perfect balance between both hands and succeeds in extracting the harmonic substance of the chords she plays. Last year, Mitsuko Uchida decided to associate Schubert and Shoenberg in an unforgettable series of recitals. By performing both composers on the same program, she tried to show Schubert's influence of the "other" members of the Viennese school. She also wanted to show the audiences both the more conventional side of modern music and the somewhat prophetic quality of classical music. Mitsuko Uchida plays Schubert as if he were still alive, conveying his tenderness, his subdued passion, his nostalgia, and the mystery surrounding his music. By doing so, she successfully touches the heart of thousands everywhere and proves herself to be an exceptional pianist.